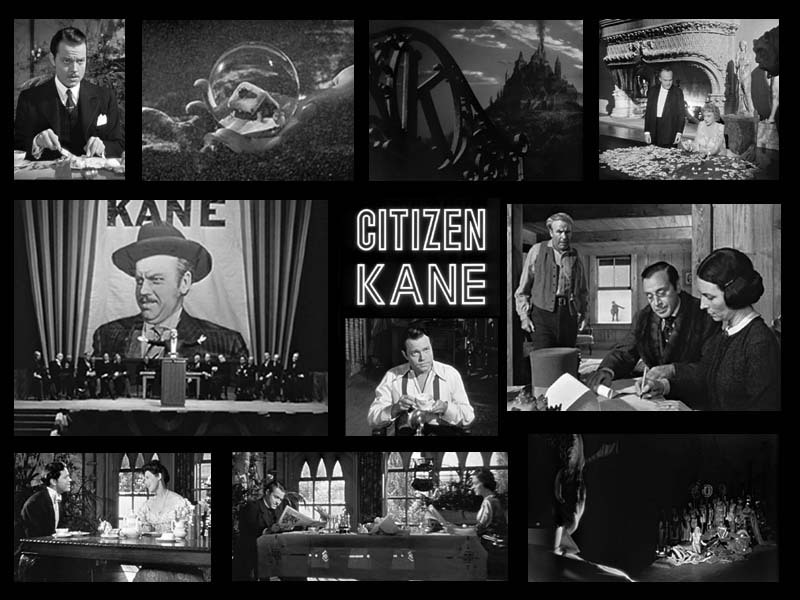 Citizen Kane is often called the greatest movie of all time. I am not sure about that, but it is certainly one damn good film. 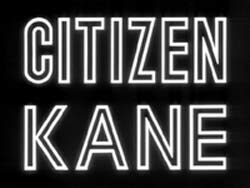 Citizen Kane is also a veritable filmic dictionary of cinema - bringing together nearly every known cinematic techniques, and I hope this site will give some idea of its inventiveness. Movie starts with shots of fences and more fences. It also features series of dissolves. 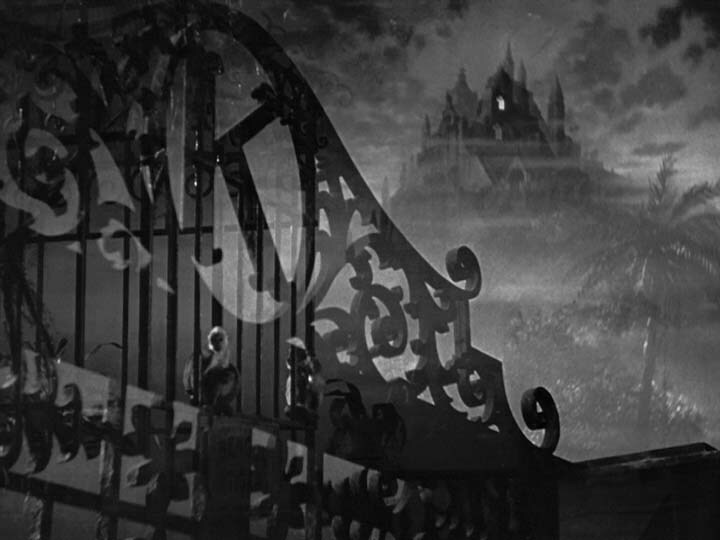 Here you can see foreground first shot(fences with K) and background of next shot (Xanadu Castle) superimposed. 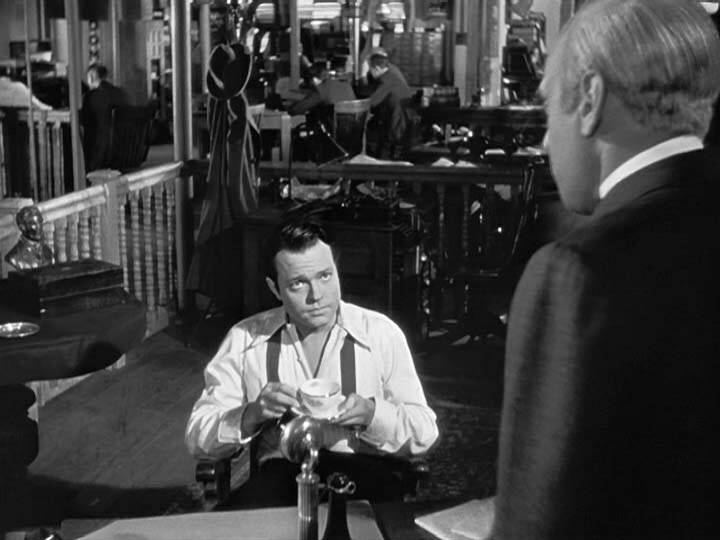 Throughout the film, Welles would often fade out one plane (background or foreground) of first shot, then fade in different plane of new shot, then fade out remaining plane of first shot, and then bringing the other plane of new shot, thereby completing the change of scenes. 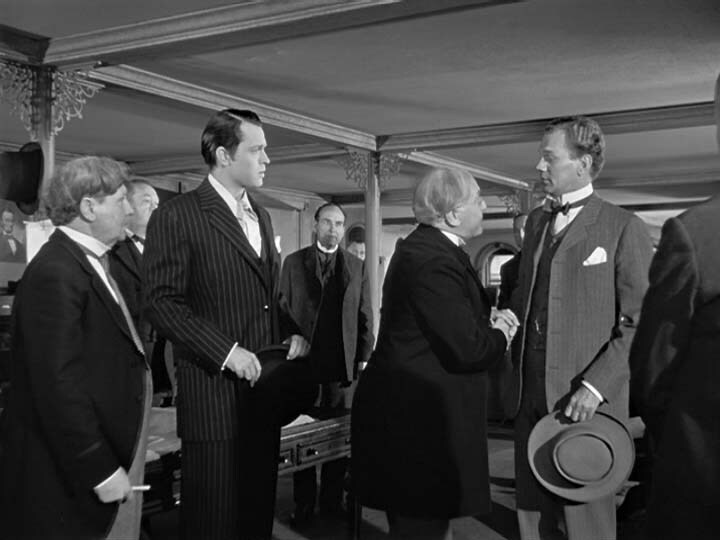 Welles was a perfectionist, and each scene and frame of the film was carefully constructed. 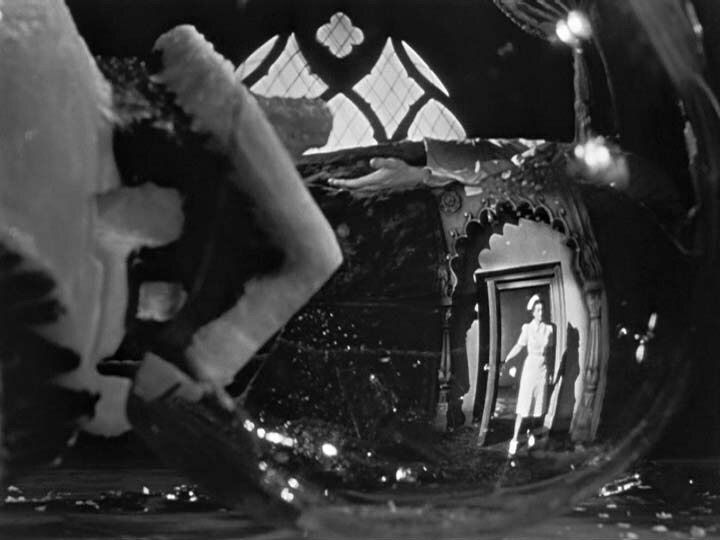 The use of strange angle through broken glasses as well as stark lighting and oppressive sets are examples of German Expressionist influence. 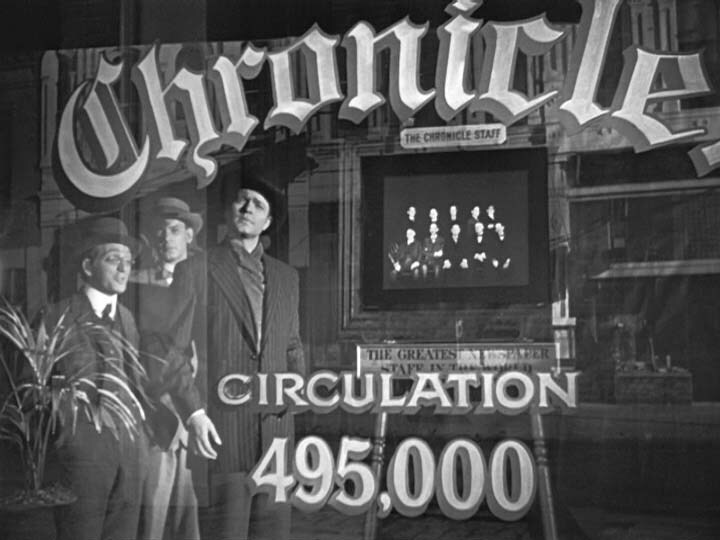 This scene is followed by a newreel section, which is clever imitation of March of Times, which gives us general idea of Charlies Kane, the title character. Appropriately, it's superficial and we learn next to nothing about him. 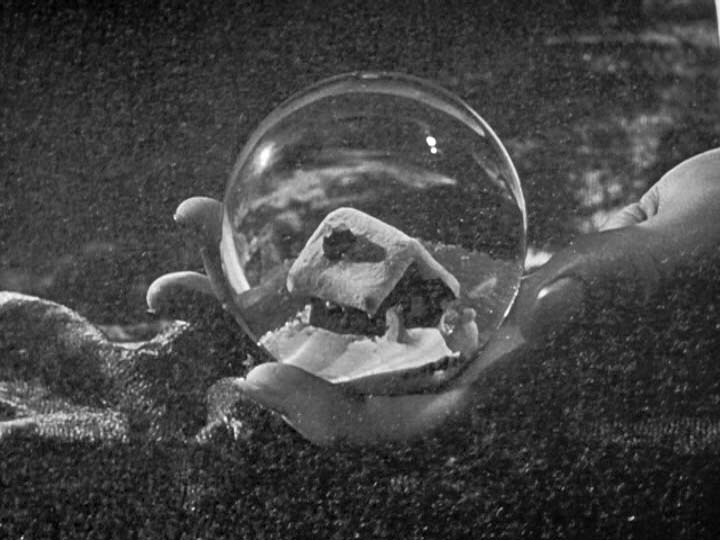 And as the reporters search for the meaning of 'Rosebud', we will learn what is behind all that gloss. 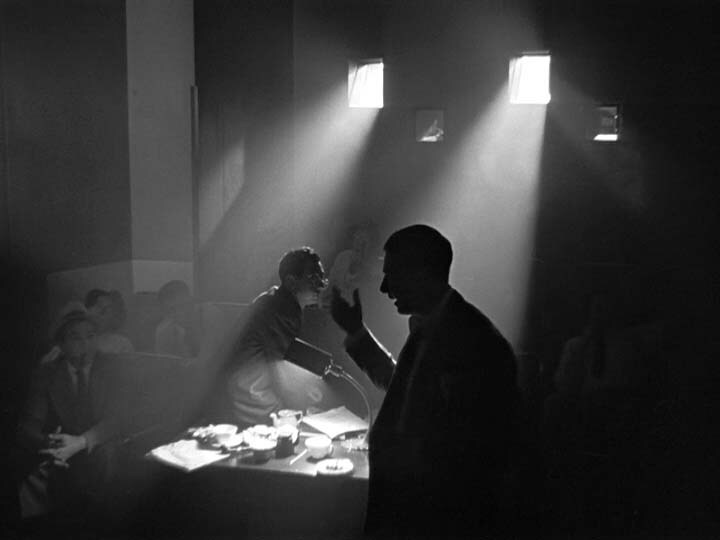 Example of extreme backlighting to the extent that figures appear as silhouette. Due to this technique, characters remain anonymous. 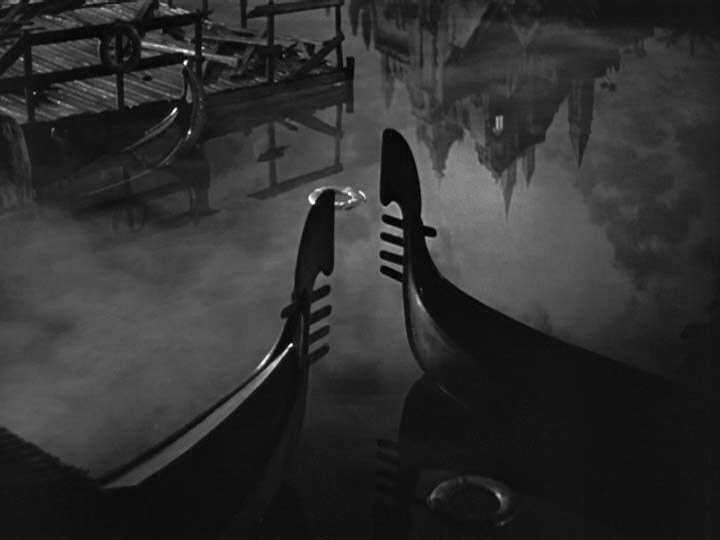 It is too bad that these images can only show mise-en-scene and not the film's excellent use of editing and camera movement. After interesting transition, we are introduced to Kane's love, Susan Alexander. A shadow was moving across her face, and I captured this image right at the moment when it hit her cheek. Even shadows are carefully placed in the frame. Again expressionist technique to create a forbidding atmosphere. This is an excellent example of deep focus cinematography. In this scene, there are three main planes. 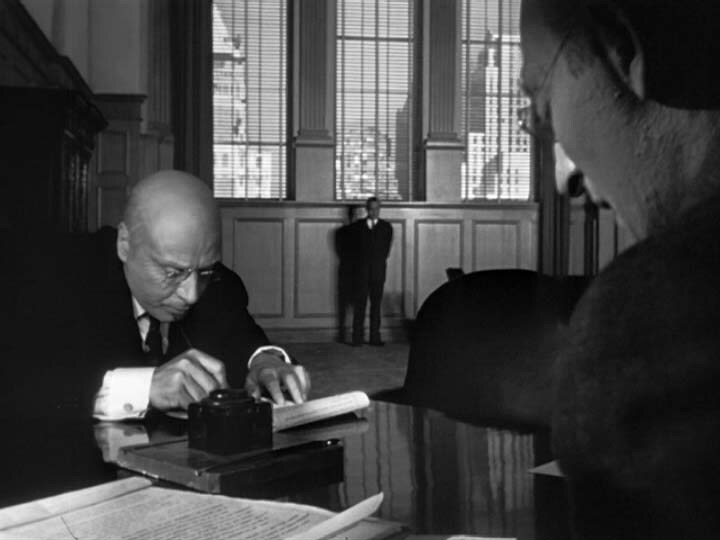 Usually, a director would focus on the foreground, in this case, the mother signing paper, and the rest of plane would be out of focus. 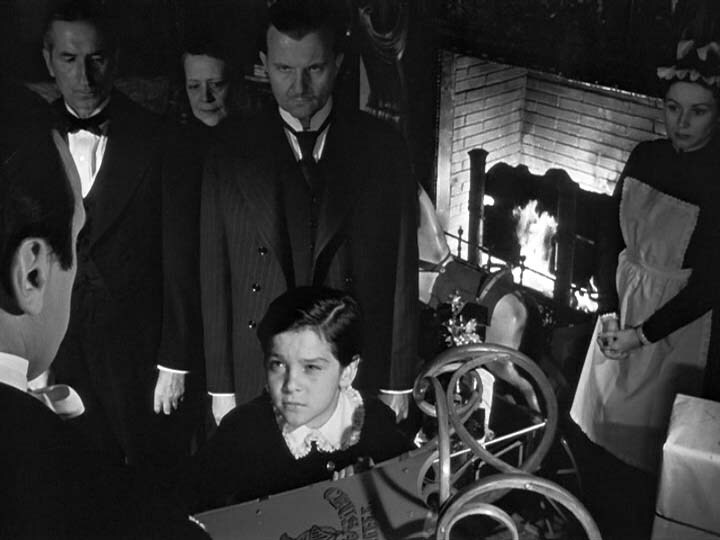 However, in this scene, all three planes - the mother at the front, father at the door, and young Kane outside the window - are in focus. 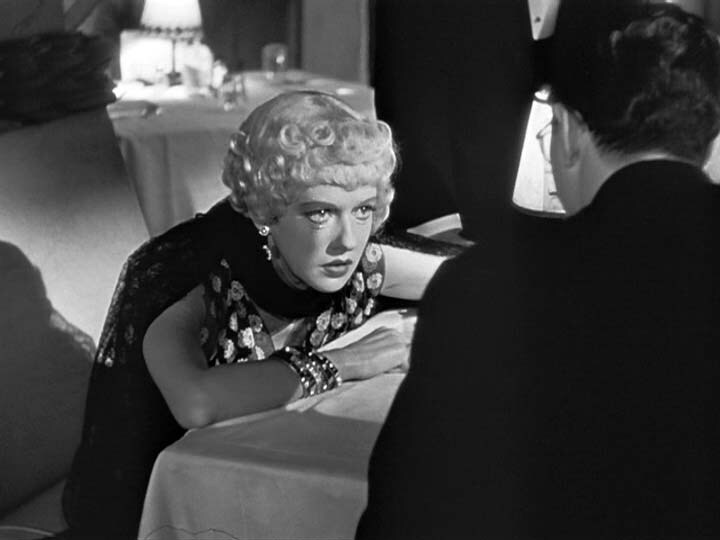 Deep focus is sometimes prized in realist school of cinema because it gives the audience a choice of where to look at rather than limiting their attention to focus. 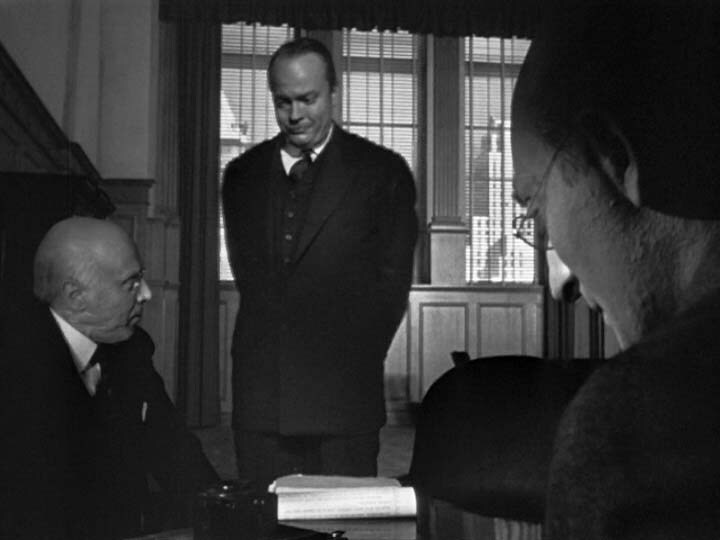 Welles directs the audience's attention to the mother signing paper by having all other characer look at the paper. It is focused through eye lines. And outside the window, young Kane is full of activities throwing snowballs, which attracts the audience's attention. 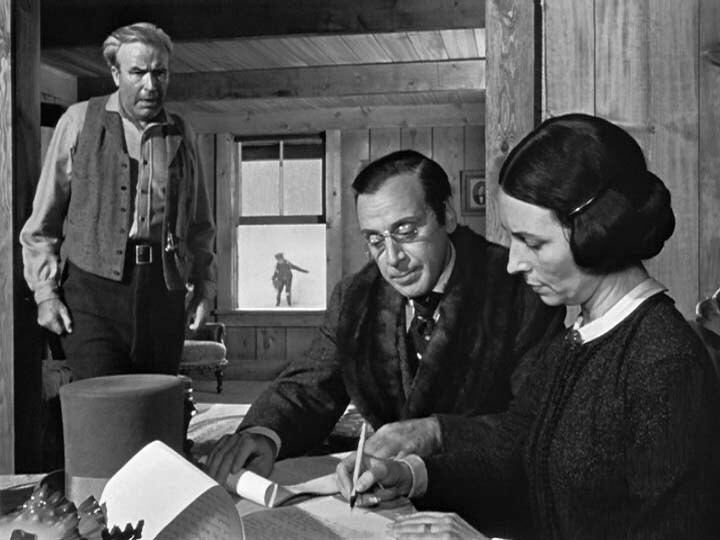 So the focus in this scene is on the signing and young Kane, emphasizing how mother is signing away the control of her son's life away. 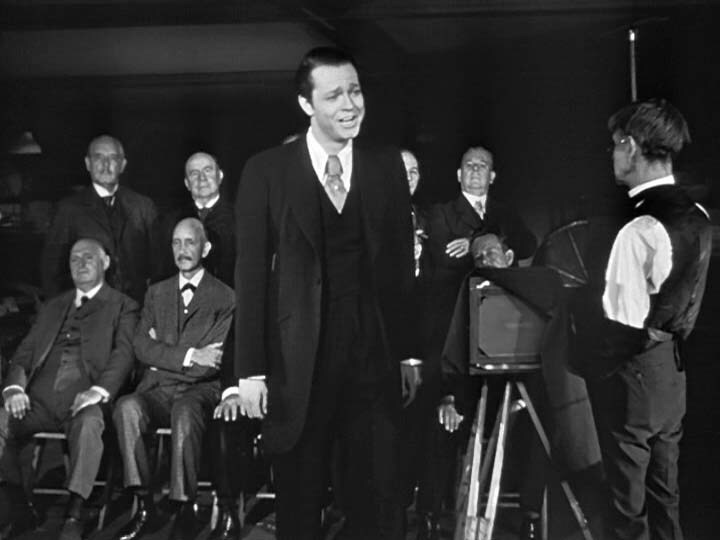 A character looking at the camera (and audience) is a techique often used in comedy. A man reading newspaper behind Thatcher serves like a mirror showing what Thatcher is reading. 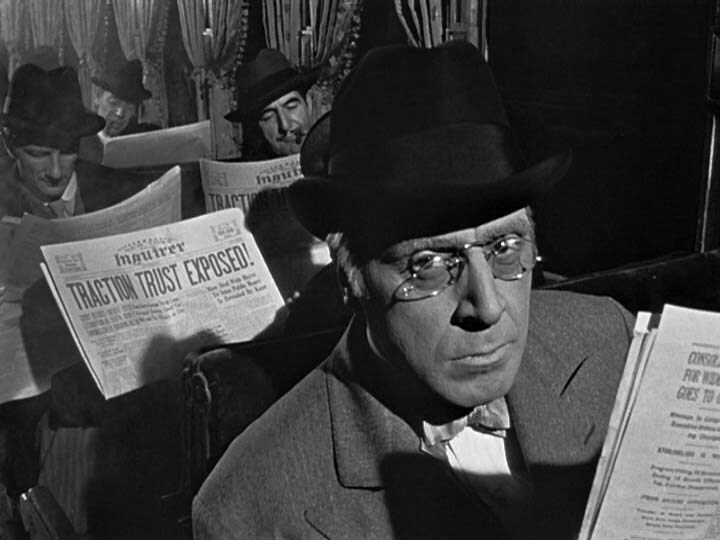 Charles Kane at last. His young years as an idealistic defender of little men is typified by his humble costume. Later as time passes, his costumes will change accordingly representing his mind-set. 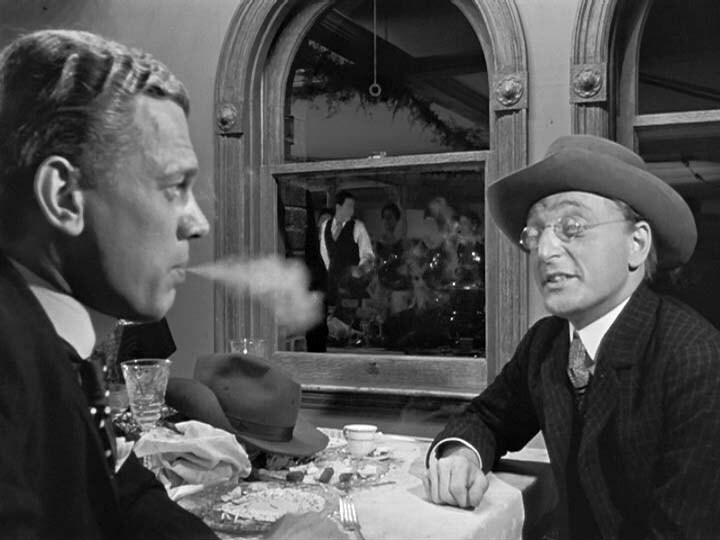 In this scene, Kane in the background is dwarfed by giant windows that are 6 feet above floor. Now that Kane is in the foreground, windows look to be ordinary size. A visual pun. 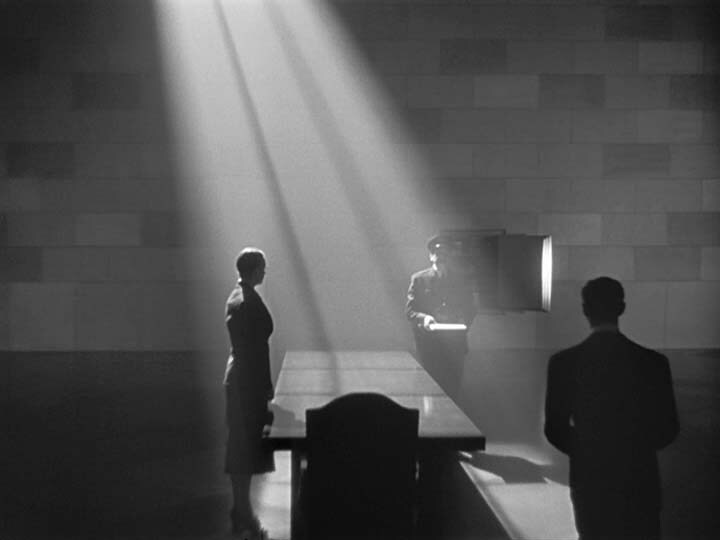 Welles loved to show the ceiling in this movie (generally ceilings are hidden in movies because they are often cluttered with microphones and other equipments). 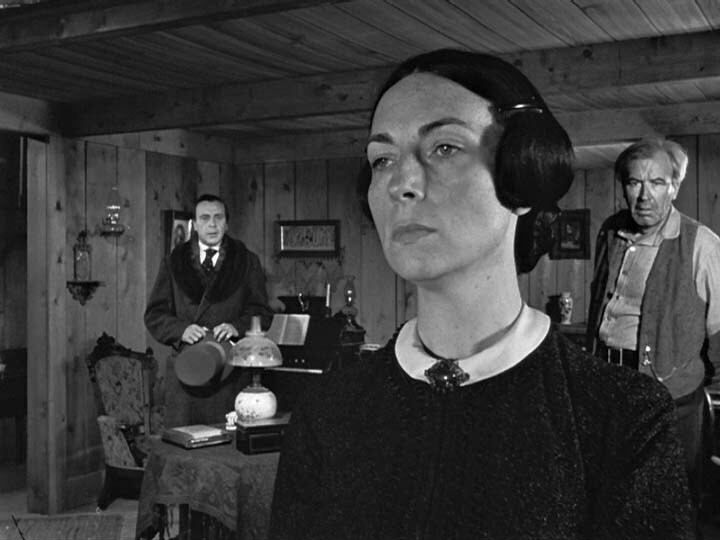 Sometimes Welles had camera at floor level to get the low angle. Another excellent transition sequence where the photograph . 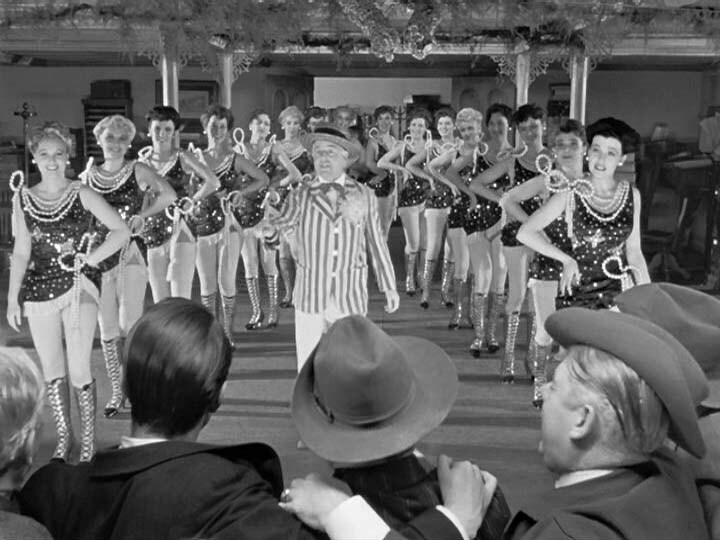 . .
Citizen Kane has elements of drama, comedy, documentary, and all; so why not some musical number? Leland, Kane's friend who is beginning to worry about Kane's egomaniac tendency, figuratively blows into Kane's face.